With smiling and excited faces of more than 80 kids Down Syndrome Parents Society (DSPS) - Delhi a chapter of Down Syndrome Federation of India (DSFI), for the first time in Delhi/NCR organised a Health Camp for the Persons with Down syndrome. Over 100 children were registered for this health camp out of which more than 85% could actually turn up; making it a huge success for the ‘First Timers’. I reciprocate same feeling s .... really thankful to whole team .With more heartly wishes to Rekha Ma,Deepti n Ranjan Ji ....it was big help ...n faultless program... please continue making such efforts. I would thank all the organizers from the bottom of my heart. Conducting such an event is a herculean task, but it was done with absolute perfection. Not only it was beneficial in medical sense but also extremely informative. The best part was to network with so many different parents to share their experiences. Thank to all. Kindly keep arranging such events in future. It was a pleasure being part of this event. Please let me know if any help is needed in future as well. 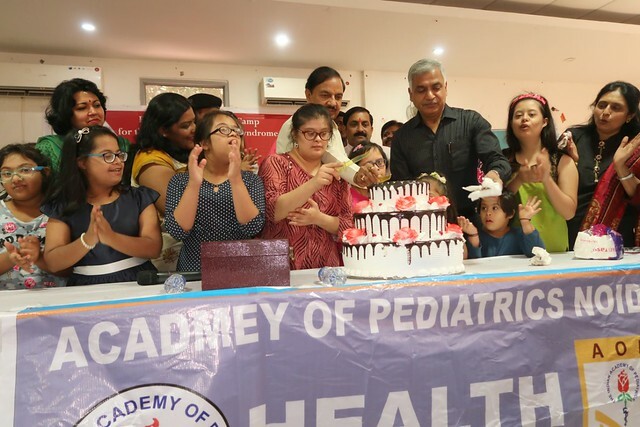 The Health Camp organized at IMA House in Noida by the Down Syndrome Parents Society under the aegis of the Down Syndrome Federation of India was the first of its kind in Delhi where parents got to speak to doctors and get issues addressed by them. Almost a 100 children were present and specialists ranging from pediatricians to speech therapists were available to answer queries. Since all parents had been asked to get the test results of their children as well as their x-rays and other medical records, it was smooth sailing for everyone. The event was well organized by the Delhi team.